It's called Hunter, not McCall (Hunter's partner, played by Stepfanie Kramer). So, I was disappointed in this DVD when I first opened it and realized it didn't have any audio commentary or an interview with star Fred Dryer (for those who don't know, the ex. L.A. Rams football star who played Hunter). It did, however, include interviews with creator Stephen J. Cannell and Kramer. Those interviews were good, and insightful, but they didn't help me with my longing for a Fred Dryer interview. I got over it quickly, though. Especially since I was not a Hunter fan, and never really watched the show, because I didn't know a lot about it. Sure, I had seen an episode or two, but I didn't understand the full premise or plot behind the series. I'm hooked now. I'll admit it. I'M HOOKED! After watching the hour-and-a-half pilot, and the two other episodes on disc one, I wanted to not work, grab some yogurt and crackers, and keep watching episode after episode. The DVD quickly converted me to a fan (I have now even began watching latter-day Hunter episodes on TV Land and find the show's massive differences between season one and the season that TV Land is currently spinning interesting, to say the least). After making it through all six-discs, I now can't wait for season two to be released! Hunter is, hands down, one of the best cop-drama shows on television, and Anchor Bay Entertainment's treatment of the re-release is fitting, giving the classic show new legs, to convert new fans (like myself) and please longtime fans of the show. 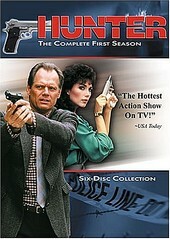 More than just nostalgic, Hunter -- Season One is a DVD collection worth owning as the show's power is magnetic. However, now that I'm a fan of the show, the absence of a Fred Dryer interview is starting to disappoint me again. I'll give this a B.